Nongprue vendors offered free food and drinks at Nong-Or Temple’s “kathin” festival to honor both monks and HM the late King. Booths were set up outside the monks’ dormitory Oct. 24, offering rice and noodle dishes, curry, meatballs, coffee and tea, all to make merit for the annual festival. The kathin festival is a Buddhist tradition held at the end of rainy season. The festival generally lasts for a month and is a time for temple patrons to express gratitude to monks. Robes are the most-common gifts lay Buddhists bring to make merit, but food offerings are common as well. Wanna Yuthisri of Somtam Inter restaurant said she wanted to participate in the festival to make merit, but also honor His Majesty who, she said, “worked hard for Thai people’s well-being and happiness his whole reign. 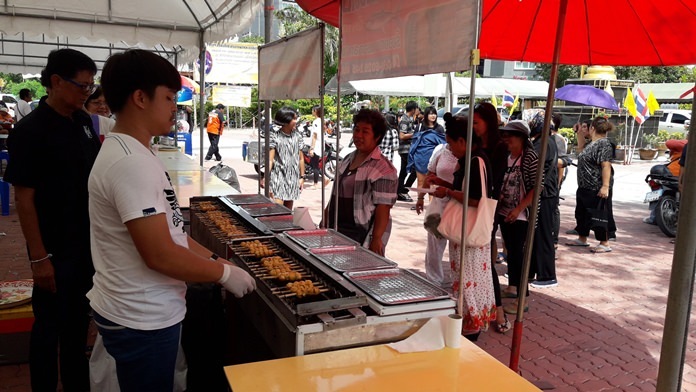 “Som Tam Inter and her family wanted to do good things by selling food at a fair price and not take advantage of consumers in compliance with HM the late King’s teachings of a sufficient economy,” she added.